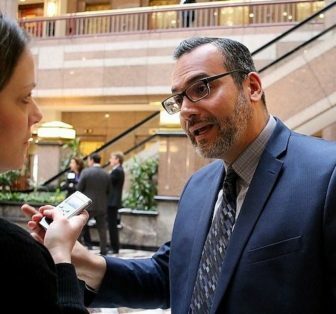 New Haven State Rep. Juan Candelaria got to see firsthand last week the face of opposition to his proposal to legalize recreational use of marijuana: It is suburban. And possibly wearing braces. The face of opposition: suburban children. He also got a sampling of the arguments he and other legalization proponents will hear as they seek to advance a legalization bill through this legislative session. Candelaria sat in to watch teens from towns like Guilford pack a Capitol press conference hosted by a lawmaker who represents them, Republican State Rep. Vincent Candelora, who also represents Durham, North Branford, and Wallingford. People often mix Candelora and Candelaria up because their names are similar. But they’re in different parties, and as last Thursday demonstrated, they play leading roles on different sides of the issue of legalizing the recreational use of marijuana. 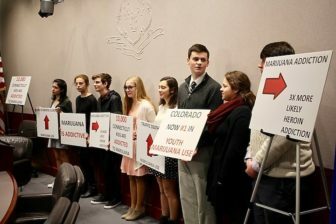 The teens, who were organized by the Connecticut chapter of Smart Approaches to Marijuana (CT SAM), flanked Candelora. They held signs that proclaimed “Marijuana is addictive” and argued that teen marijuana use and traffic-related deaths are up in places like Colorado that have legalized recreational marijuana. The press conference was also meant to draw attention to a report released by SAM called “Projected Costs of Marijuana Legalization In Connecticut,” which uses data from states like Colorado and the state Office of Fiscal Analysis to challenge the notion that legalization will produce a financial windfall for the cash-starved state. The report estimated legalization would cost the state $216 million a year by 2020 because of car crashes, emergency room visits, chronic absenteeism, and workplace injuries. If true, that would more than offset the $45.4 million to $104.6 million the Office of Fiscal Analysis estimates that legal weed would generate in new annual revenues. Proponents of legal recreational use affiliated with Connecticut NORML also sat in on the press conference and were ready with their own fact sheets countering SAM’s claims. Candelora said that is because when lawmakers hear from experts about the science and the health risks, they conclude legalizing marijuana is not a good idea, especially for teenagers. “As we all know, there’s a lot of money involved in marijuana. But when we talk about the science and the health risk people begin to back off,” he said. And he said the only people who truly stand to profit from recreational marijuana are those in the industry, not the state. 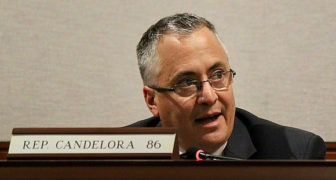 Candelora said he finds it “astounding and personally offensive” that people would argue that because border states like Vermont and Massachusetts have made recreational marijuana use legal, it is inevitable that Connecticut will follow suit. “I think just because another state is doing it doesn’t make it right for Connecticut,” he said. Dr. Deepak Cyril D’Souza, a professor of psychiatry at Yale University School of Medicine has conducted cannabinoid research for more than 20 years. At the press conference, he outlined three of his main concerns around the legalization of marijuana for recreational use: cannabis is addictive, it has a negative impact on the developing brain, and it impairs driving. D’Souza, who lives in Guilford, said he drives to work on I-95 every day, and he personally doesn’t want to contend with anyone operating a vehicle under the influence of cannabis during his commute. Nor does he want to have his own teenager exposed to the negative consequences of cannabis use. He argued that studies have shown that THC, the chemical component of marijuana that produces the high feeling, distracts from attention, memory and executive function. He said the cannabis of today is much more potent than that of nearly 60 years ago. That will produce bad outcomes, particularly for children, increasing their risk for schizophrenia and other serious mental illnesses, he argued. D’Souza also noted that the hospitalization, the inability to work, and the lack of effective treatment for marijuana addiction along with the increase in traffic-related deaths, will all mean added costs for the state. He claims lawmakers fail to factor in those costs as they consider how the money might plug the state’s budget deficits. “We must take all of this information into account before we make a decision,” he said. “We must look at the science and look at the financial costs before we make any decision about legalization. Candelaria and Candelora actually have common ground on the quest to prevent the teenage use of marijuana. Recreational marijuana use wouldn’t be legal for teens under Candelaria’s bill. Just for adults and the limited number of young people who already have access because of the state’s current medical marijuana program. 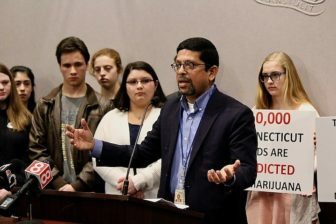 Candelora and his supporters argued Thursday that legalized marijuana that is taxed and regulated by the state would increase teenage use by shifting the perception of “recreational use” as natural, fun and non-addictive. Candelaria disagreed. Speaking after the press conference, he argued that teens already have access to marijuana. He argued that refusing to legalize it does nothing to stop the illegal sale and access that teens have to an unregulated black market. One of the arguments Candelaria heard Thursday that caught his ear is that the levels of THC are much higher than in the pot of many legislators’ youth. “Well if we regulate it, we’ll know what the levels are,” Candelaria said. He also raised concerns about statistics opponents provided Thursday on the increase in automobile accidents and fatalities in Colorado since marijuana was legalized there. He said that concern grew when a member of the Police Chiefs Association acknowledged at Thursday’s press conference that there are no good tests to detect whether someone is under the influence of marijuana, or to determine how long marijuana found in a person’s body during the time of an accident was there, thus impacting whether it was a factor. Deepak Cyril D’Souza, Yale professor of psychiatry, Guilford resident, and father. Many legalization proponents represent cities, where they say marijuana laws disproportionately lead to blacks and Latinos getting locked up. For New Haven legislators, legalization is more a criminal justice issue than a revenue issue, though they also tout the benefits for state coffers. Candelaria Thursday said it wasn’t lost on him that legalization opponents hail from suburban towns; some polls suggest that nearly 71 percent of the state’s residents support legalization. He said lawmakers from those towns are also the ones who have advocated for budget cuts but not supported other potential money-makers for the state, like highway tolls. Meanwhile, New Haven faces $10 million in education cuts even though its student enrollment continues to grow. And the cities continue to provide access to social services for suburbanites whose towns don’t provide them. “I haven’t heard anything but, ‘We need to cut,’” Candelaria said. Later Thursday, the legislature’s General Law Committee, on which Candelora serves, voted to allow lawmakers to raise a bill about the regulation of the retail sale of marijuana and hold a public hearing. The bill doesn’t make marijuana legal; it could structure how the state might go about regulating retail sales if the legislature does separately pass a proposal like the one Candelaria has been pushing for the last five years. Candelora voted in favor of allowing the bill to be raised, though several of his fellow Republicans voted against it being raised. At least one colleague questioned if it were a back-door attempt to change peoples’ minds on the legalization question. Candelora said he voted in favor of the measure because he generally supports allowing lawmakers to hear the issues.